One electronically tested platinum ladies cast alexandrite and diamond ring with a bright polish finish. The featured alexandrite is set within a diamond bezel supported by a lattice under gallery and diamond set shoulders, completed by a one and one-half millimeter wide band. Trademark is Orianne. Identified with markings of PT950. Condition is new, good workmanship. One prong set cushion modified mixed cut natural alexandrite, measuring 10.37 x 9.33 x 5.46mm, exact weight 4.72ct., type II Clarity is slightly included, medium dark, very slightly brownish, greenish yellow color, (GIA gY 6/3) to medium dark, very slightly grayish, yellowish brown, (GIA yBR 6/3), cut is good. Transmitting light with a minimum of distortion, transparent. Naturally occurring internal & external characteristics are present. GIA Gemological Report attached. Graded loose prior to setting in the GIA Laboratory, Report #2234044760. Thirty-Four prong set round brilliant cut diamonds approximate total weight of 34 Stones = 0.32ct. Graded in the setting. 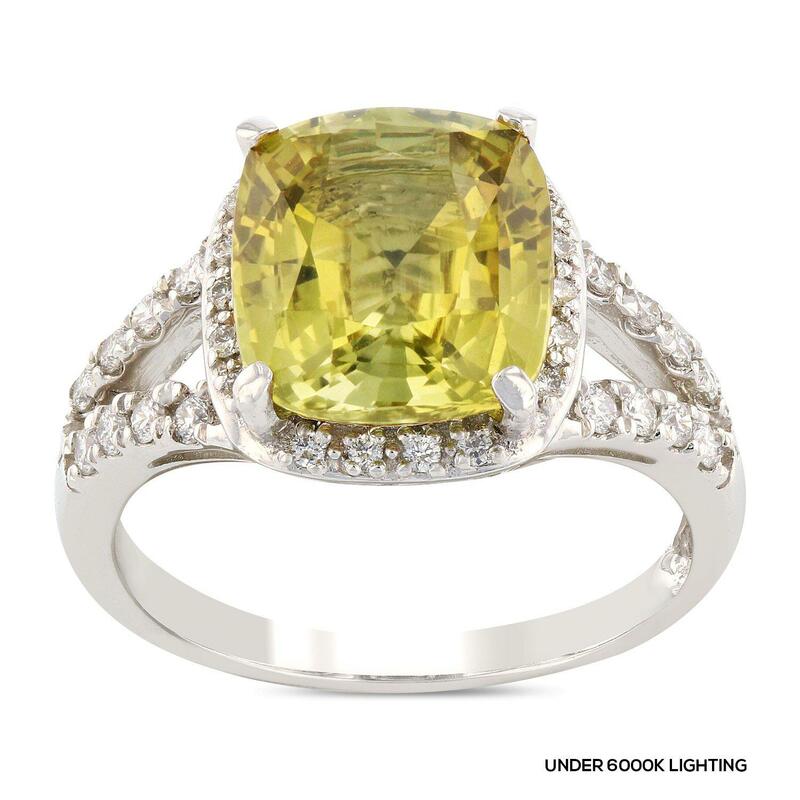 Total Weight of Colored Stone 4.72 ct.
Total Weight of Diamonds 0.32 ct.